I was blessed to attend two aviation conferences in March. They were back to back, both in Nashville, so that was great. It lasted a full week and was incredible on many levels. There were many highlights but I must give a shout-out to Dan and Corine Brennan’s daughter, Katelynn. It was fun to see her again and spend a couple nights with her, as she lives just outside of the Nashville area. Nashville has definitely become my favorite place to go when I need time away from home. The first conference was a maintenance conference. It was good to hear the different seminars and meet new people. I was reminded, yet again, about the seriousness of my job and it spurs me on to remain studious. The second conference was such a blessing! You know those moments in your life that you don’t know if you will ever experience again but so glad you were given the opportunity—yeah, this was one of those! 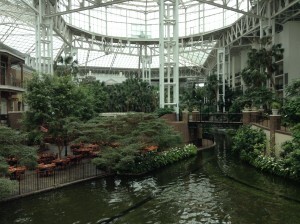 The conference was held in the Opryland Resort and Convention Center. It was soooo gorgeous! The company was awesome too; 5,400 women (and some men actually) all pursuing a career in aviation. How inspiring! 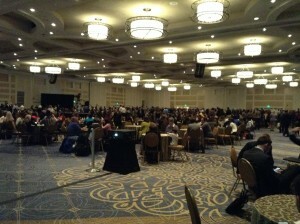 Over 5,400 people (mostly women) gather for the annual Women in Aviation Conference. The first day, I attended another maintenance conference. This was different though. There were about 20 other women with me. All of them were mechanics or in training to become mechanics. It was SO refreshing. They thought like me 🙂 It was SUPER encouraging to know I wasn’t alone in my endeavors. The remaining days were filled with education sessions and general sessions. My personal favorite was a general session talk given by Jessica Cox. She was the first pilot to receive her license having no arms!!! Yes, none of those ten digits we eat and write with! Yeah, she flies planes without arms at all…for fun 🙂 I feel like if she can do it, anyone can! The week was closed out with a semi-formal banquet. I sat next to a lady in the morning session who had a ticket to the banquet she wasn’t going to use. She had been praying that God would lead her to the right person to give it to. And, there I was; a happy recipient 🙂 It was a $95 value. At the banquet, I ‘just so happened’ (not really) to sit by two girls who were also pursuing or at least considering missionary aviation. Both of them were Christians! How cool is that? I mean over 5,400 people at this event and I sat next to two young ladies interested in missionary aviation! Incredible! God is amazing, isn’t he? The younger of the two girls lives about 45 minutes from me and I am hoping to connect with her and her mom in the near future. On to Easter–my favorite holiday. I mean, I love Christmas music and all but who can compare with the celebration of Christ’s victory on our behalf, overcoming death and the grave and reigning on the throne forever! He is worthy of all our praise!!! I was blessed to spend this time with my sister, her children and one of her single-mom friends and her children. 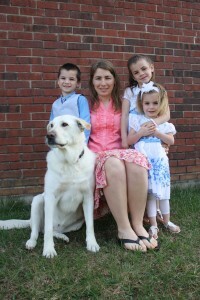 I was most blessed by the wonderful way my sister incorporates God’s truth into her children’s lives whenever she can. She is a wonderful mom and I am so blessed to be her sister.